The US Marines have banned social networking sites (SNS) like Facebook and Twitter. The one-year ban has been instituted to avoid exposing military secrets or other high-value information on public services available to "adversaries". INTERNET SNS ARE DEFINED AS WEB-BASED SERVICES THAT ALLOW COMMUNITIES OF PEOPLE TO SHARE COMMON INTERESTS AND/OR EXPERIENCES (EXISTING OUTSIDE OF DOD NETWORKS) OR FOR THOSE WHO WANT TO EXPLORE INTERESTS AND BACKGROUND DIFFERENT FROM THEIR OWN. THESE INTERNET SITES IN GENERAL ARE A PROVEN HAVEN FOR MALICIOUS ACTORS AND CONTENT AND ARE PARTICULARLY HIGH RISK DUE TO INFORMATION EXPOSURE, USER GENERATED CONTENT AND TARGETING BY ADVERSARIES. THE VERY NATURE OF SNS CREATES A LARGER ATTACK AND EXPLOITATION WINDOW, EXPOSES UNNECESSARY INFORMATION TO ADVERSARIES AND PROVIDES AN EASY CONDUIT FOR INFORMATION LEAKAGE THAT PUTS OPSEC, COMSEC, PERSONNEL AND THE MCEN AT AN ELEVATED RISK OF COMPROMISE. EXAMPLES OF INTERNET SNS SITES INCLUDE FACEBOOK, MYSPACE, AND TWITTER. The ban also includes a variety of carefully spelled-out exceptions, as well as an institutional mandate to study and learn more about how the use of these sites can add value for the people in the military and to the service. Although I can't think of a reasonable sfnal predecessor for this ban, there's something very Heinleinesqe about it. Robert A Heinlein graduated from Annapolis in 1929 and served until 1934, after developing pulmonary tuberculosis. His novels, particularly the early stories, are heavily influenced by what he learned in the service. 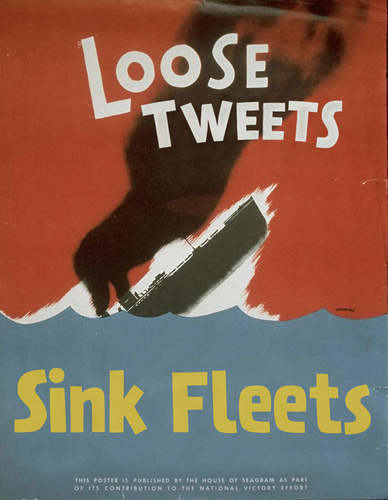 From the Marine Corps via lots of sites; see more "vintage military IT posters".